Google has given its online translator a little love, with a new look and functionality to make it easier to use. 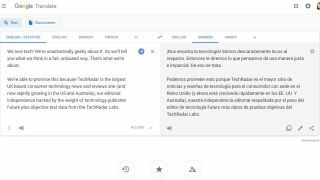 Google Translate for web now has a cleaner look and a responsive design that adapts dynamically to suit your browser – whether you're using it on a desktop, phone or tablet. The change is part of a raft of updates designed to bring Google's web-based tools up to date and standardize their designs. Gmail, Google Calendar and Google Drive have all been spruced up this year, and now it seems the company has moved its attention to tools outside G Suite. Several of the other changes simply make Google Translate's existing features more accessible. For example, the option to upload documents is now much clearer, presented as a large button at the top left of the page. It's also easier to save translations you use frequently; simply select the star icon to add a translated snippet to your favorites. You can access and saved translations using the 'Saved' button at the bottom, and organize them by language with a single click. Google Translate is one of the company's most useful but least glamorous tools, so it's good to see it getting some attention on the design front. When it first launched 12 years ago, it was only capable of translating between English and Arabic. Today it supports 103 languages, and is used to translate 30 trillion sentences per year.